I am listening to Coldplay's 'What if' from their new album X & Y. This essentially means, I don't control my life (atleast a part of it). If you decide that I shouldn't be there by your side, I cannot. That is the futility of my effort. Why should I even try? The first thing I decided, I would do after I save some money during my internship in my final year - was to buy myself a laptop. Far-fetched plans, but it feels good to think of the day when I can buy myself something from greenbacks that I earn. But, just after I was following up on the IIPM issue that I blogged about, I came across this really insane threat on a posting on Gaurav's blog. Well, to cut things short, Gaurav (an IBM employee) is the blogger who first placed links on to Jammag's article regarding IIPM, and questioned Arindham Chaudhuri's credentials. So, IIPM threatens to slap a Rs.125-crore lawsuit against Gaurav if he did not withdraw his posts and make fellow-bloggers do the same. Obviosuly, Gaurav didn't give a damn, until his IBM manager called him up saying that the IIPM Dean threatened that IIPM students would burn Thinkpads in front of IBM's office if they did not take action against Gaurav. So, Garurav out of respect to IBM (and of no pressure from IBM) resigns from his job. And upholds 'Free Speech'. IIPM has lost all the remaining grains of respect that I had for it. If such is the case with institutions that churn out so-called MBAs, then may I pray for the future of corporate India. Gaurav Sabnis writes in Vantage point: The fraud that is IIPM about the IIPM issue that is haunting the blogosphere these days. Earlier in the day, Dilip called me up about his upcoming visit to BITS, and he spoke to me abou this. Though I had vaguely heard of Rashmi Bansal of JAM being involved in some trouble with IIPM, I just got to know of the huge mess that has surfaced. That really showed what the industry and the academic circles viewed IIPM as. Then comes the pony-tailed hero (is he still one?) - Arindham Chaudhary. Hadn't really observed - but his credentials haven't been made public at all. But who gives a damn - his book is pretty much decent (certainly not as good as it has been hyped). Who knows whether it was him who actually wrote the book !! Btw How is Planman Consulting doing? As far as I heard - its following a weird path. If I am not wrong they are getting into the movie biz (or probably they are already in!). Insanity prevails! No more full-page ads in the newspapers titled 'Dare to think beyond the IIMs' ! I remember my musings on a diesel locomotive, that I blogged about some time back about my train journey from Bangalore to Mysore on a rusty weeekend. It was Deja Vu last Friday. The questioning resurfaced. Why on Sweet Lord's Earth am I racking my head on cryptography and field programmable gate arrays and silicon wafers? Why am I cribbing that I will score less than 10% in my mid-term tests? Why am I slooging with the dream to pack off for grad studies to some foreign Univ? Why......When all I did after coming back from Garinda was weep within myself. Yes. My heart still skips a beat when those images of that girl with brown teeth flashes in front of my inner eye. If only I had a cam then, could I have taken a snap and shared it with all of you. Last Friday, I accompanied some of my friends (most of them part of the Rural Entrepreneurship Division of the Center for Entrepreneurial Leadership, here at BITS Pilani). As I boarded the chug-chug auto (or phat-phati as it is better known as), little did I think of what I would see there. As we slowly made our way through the dry fields of one of the most backward districts of Rajasthan, all I could feel is heat, and a certain emptiness. We were headed there to resurrect a Vocational training centre for women at this village called Garinda. 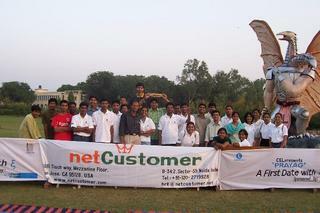 This was part of the activities of CEL, BITS-Pilani. And, as we reached the place, about a dozen kilometres away from BITS, we were led to a room which was just cleaned, as we were expected there. And, then the women started pouring in to register for vocational training. We conducted a socio-econommic survey of the women. I administered the survey on 5 women of them 3 were girls (below 18), and one was 60+. Despite the language barrier, I went on, and with every reply from them, the urge in me grew - the urge to run outside, kneel down, and yell at the top of my voice at the sky, and cry my heart out. For the first time in my life, I saw right in front of my eyes, the true grim face of poverty, of suffering. Especially the young girls, I wept within myself at the gross disparity in our country which isolated them from the rest of the world. They were all being consumed by a life of slow decay. when she was serving us food. That morsel struggled to make it down my throat. I presume my education will help me bring about a 10X change in the heart of poverty. PS - One thing that surely has to be up here is what happened after the whole day. I sat and put a night-out preparing a paper that I had just conceptualized. It's amazing how my mind can make that transition from chaos to serenity and vice versa.